is that really ugly? *download* ohmy... it's not sweetie ^^. 1stly it is not a master of wall, yes of course, you know that too ^__^, you're on a good way to become good waller ^__^, and dont satisfied at what we got now is the best way to improve our skill ^__^. It makes untalented people such as myself cringe when you say you don't like something like that and that it's simple. Simple or not i like this one and it's a good choice of scan, not an overused one which is nice. The effect over the wall are numerous and beautiful and nothing looks out of place. It's interesting as at a first glace it looks like she's in the sky, although she actually appears to be in a pond with the reflection of the sky around her which is extremely clever. Then as a final perfect touch the lyrics in the bottom right, a reminder of the ending of the movie. If your not satisfied with something as beautiful as this then I crave to see the walls that extremely satisfy you! and also with that yellow dots on the char, kinda distracting. Not bad! I really like it! The colours are soft but they look nice! it seems the majority ^ believes that this is a wonderful piece of work including me. it doesnt matter if a wall is simple it can still deliver and express more then a complex wall can. Yes this certainly is lovely. *nod* Cute scan and pretty nice background. Great job! OMG You've got to be kidding, this wall is simple, but real awesome! The magical swirls are really lovely! I love everything about this wall! Keep it up! Can I add to my watchlist? i say its really lovely! especially bcuz its misuzu! 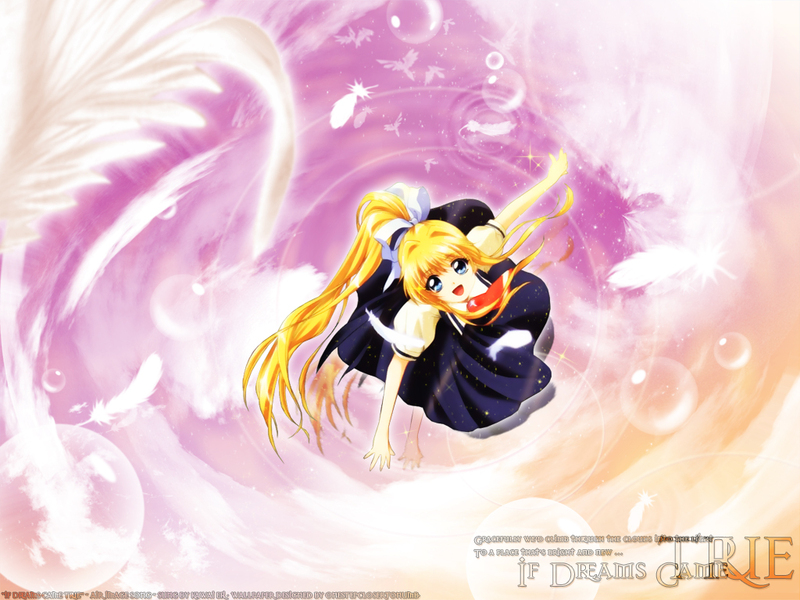 this wallpaper has very orginal scan, the whole bg is lovely, I like those effects with clouds in this work, well done! wonderful! I love this wallpaper! I wish I had seen that smile forever, but was frustrated by a sad end.